I thought John Lennon had always been a hippy but apparently I was wrong. He was kind of a badass when he was a kid. 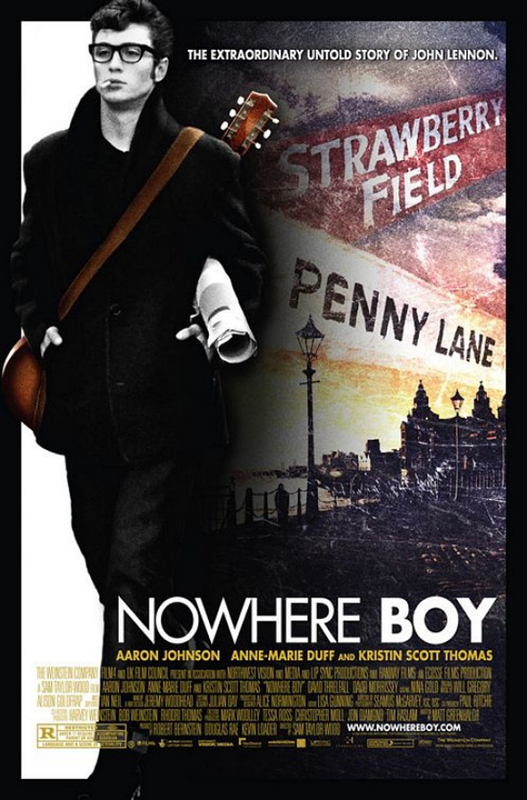 NOWHERE BOY is about his teenage years in Liverpool when he decided to be a rebel, hang out with his cool birth mom instead of his uptight aunt, bang chicks in the woods and start a band. I actually really liked it, even though I am more of a Rolling Stones guy than a Beatles guy. Didn't really matter though, because the parts of Lennon's story I really cared about were there—his first meeting with Paul McCartney and later with George Harrison. Those are the moments I wanted to see. I wanted to see if they could recreate and/or capture the magic that I imagined happened at those first meetings, and by all accounts, I thought they did really well. Unfortunately since Paul has turned into a bit of a prick about the Beatles in his old age, the movie wasn't actually allowed to use any Beatles songs (come to think of it, I'm not even sure they were able to mention the name of the band). Didn't matter much though since the bulk of the movie occurs before they had formed under the now-iconic name. I knew nothing of this movie going in, and I was pretty stoked on it the whole way. Check it out. Even if you are more of a Stones fan.